There is not way around it: even if Monaco is the track that, in theory, puts the least amount of stress on tires and where passing is so difficult Perez with half a front wing gone could keep cars behind at bay for two laps, implications of the so called "secret" Pirelli test with Mercedes after Barcelona loom large. 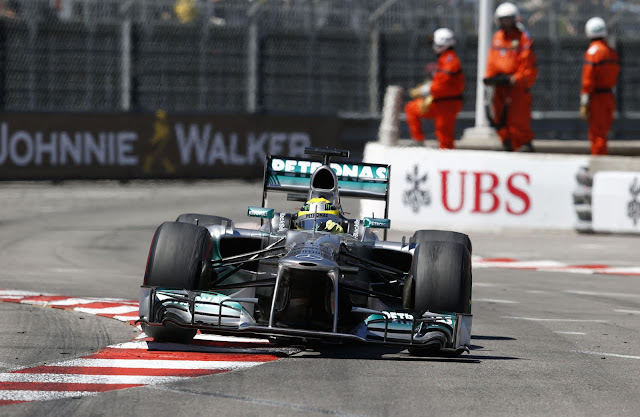 Not to take too much away from Nico Rosberg, he's been consistently fast and Mercedes were strong in Monaco even last year. Nico drove a great race despite the two safety cars and the red flag. But the tire test, conducted using the 2013 W04 chassis just stinks. Mercedes is not the only team who got a "special" Pirelli test this season, Ferrari had one after Bahrain but, it was with a 2010 chassis. The Mercedes test was with the current 2013 car, in part with development rubber and in part, and crucially with new "Canada spec" revised Pirellis. For as much as Pirelli and some parts of the motoring press might call it a teacup tempest, it's still 1000 km in a current car. Giorgio Piola had commented Mercedes would run a revised suspension for Monaco and perhaps their improved tire wear comes from that if indeed they used it. What's unknown is if they used the Pirelli session to test their own new components. As for the rest of the race, we saw Ferrari struggle badly with Massa's bizarre doppelgänger crashes and Alonso forced to settle for the long game, in the end gaining a few points on Raikkonen and losing a few to Hamilton and Vettel. Perez and Sutil were the joker in the Monaco deck. Perez drove, appropriately I suppose, like someone who has nothing to lose, because he doesn't : his funding seems secure and Mclaren needs him more than Button for the immediate future. His tactic of "I'm going, you either move or we both crash" worked better with "gentleman" Jenson and Alonso than with Raikkonen who ended up with a warning from the FIA. "Machete" Sutil had a fine race as did Vergne. Vettel and Webber just cruised along, Vettel catching a lucky break with the first safety car. Hamilton either sacrificed his race or was sacrificed by the team, not sure which. But all this is meaningless if "testgate" is not resolved properly, there are rumors of an exclusion for Mercedes from the Canadian GP! I think Lewis admitted after the race that he misjudged the timing for his pitstop (he left too big a gap after Nico). Pirelli are keeping quiet about the 'secret' test. It appears the FIA had given a conditional OK to the test but the issue here might also involve the politics of future tire supply contracts. Pirelli has yet to sign for 2014 on and this is not a good situation for them, obviously. But more damming for Mercedes is that the pests are specifically regulated NOT to have their current driver or team present. It's confirmed Mercedes used a new rear suspension in Monaco, it's very likely they got a free 1000 km of testing before the race some of it on Canada spec tires! I enjoyed watching the race. Again Perez keeps things entertaining. He's a wild man with a severe lack of racing etiquette. I think he's been watching the Senna movie too much. He doesn't care who you are, what corner, team orders, where you are on the track, the line, pavement, room, whatever. He's the guy that tripped you in gym class and dumped your books in the hallway between classes. Personally if I was his Mclaren engineer I would beef up his front wing and suspension so he can start punting folks more aggressively. who ended up with the warning from the FIA kimi o sergio ? hahaha " the guy that dumped your books halfway between classes..." i can only add a ver good praise from a very famous book "..let the dogs bark... its a sign that we are advancing.."
Kimi did, but from the on-board footage it sure looked like that Perez was going for a gap that wasn't really there. then why the warning to Kimi ? Maranello have issued a statement accepting that it was suspension failure which caused Felipe Massa’s big shunt during the Monaco GP. ‘The findings validated the first impressions of the engineers, confirming that the accident was caused by an element of the front left suspension breaking,’ the statement read. ‘With all the required inspections completed to analyse what happened at the Monegasque circuit, the Car Assembly department can now start work in preparing the car for the Canadian Grand Prix. This may sound ignorant or maybe completely wrong but lets look at the top guys. Alonso, Kimi, Jenson, Lewis. Even some of their team mates like Nico, Masa, and Grojean. Most of these guys are buddies. And if they aren't buddies they have been #2 to either one or several of these guys. Kimi for example isn't going to deliberately stuff or punt Alonso team orders or not. Regardless of the reason, maybe his idea of etiquette or "wronging" his buddy, or respect for a fellow world champ, whatever, he's not going to drive like Perez. Long story short among the presumed top guys now they are going to race a certain way. What happened to to old days when there was Mika or Schumi or dare I say it Senna with the "do whatever it takes" attitude. This included punts and crashes and countless "stuffs" aka. i'm going to get in your way, let me in or we both crash. Perez is the only guy doing it. Maybe that's what formula 1 wants? If the rumors are true and the FIA signed off on the tire tests - which did indeed require a current spec car - than this whole issue isn't something that should, by all sense, effect Mercedes in any way. Lets just pretend that all the teams KNEW Pirelli were testing after Barcelona (which we can, because the same teams lodging complaints about the tests were the teams complaining about the tires to begin with, who essentially demanded that changes be made...). There are plenty of people milling around long after the bulk of the teams have packed up and shipped off to the next destination to notice a front runner firing up them thar V8 engines to pound around what should be a quiet track to raise questions. What I mean is, Mercedes wouldn't be bold/brave enough to log 1,000km around a very public track without explicit permission/exemption to do so under the regulations. keeping in mind the veritable army of lawyers and accountants documenting every word and movement, alteration and mile/km to these cars in order to negate any possible legal challenges down the road. This is not to imply that the FIA is infallible but, for instance, Ross Brawn is not an idiot nor new to the game and would be one of many points in the chain of command double and triple checking the legitimacy of any action the put his cars and drivers on-track outside of the normal course of racing/testing allowed by the sporting regs. All of the above aside, a thought: should the team(s) who raised the complaints about the tire compound be trusted with the testing of new or adjusted compounds? If Pirelli were allowed to perform mid-season testing and changes (which, it would appear, they were forced to do based on aforementioned complaints), would it not be fair to perform these tests on a front-running chassis BUT NOT THE CHASSIS OF THOSE LODGING THE COMPLAINTS? (which is in essence, again, the root of the current issue). The mention of dead-last and second-to-last teams as potential testing chassis is, honestly, a bit of a joke, as they're unable to put the tires through comparable loads at the same speeds. I've seen some data that indicates temperatures between RBR and STR are more than 20degrees F difference at speed. Finally, all of this^, coupled with the HORSESHIT complaints by RBR about the number of stops in Barcelona this year(as mentioned here and elsewhere), compared with previous stats in previous years, shows the true nature of these complaints from the source. Ferrari used to be the main culprit behind this kind of tactic but RBR has never been shy or ashamed when it comes to hypocritical political maneuvering and whining. On a personal, separate note, I was pleasantly surprised to find the race on the main NBC channel, and - this caused me to double-take - THEY ACTUALLY SENT THE CREW TO MONACO FOR THE RACE. Commentary was still painful to listen to, and the commercials were still awful, but Matchett was withing sight of the paddock for the first time in years. There may be hope for American F1 yet. I even heard Ron Howard plug the New Jersey F1 race on the Indy pre-race. Or maybe it was the post race. Small victories.